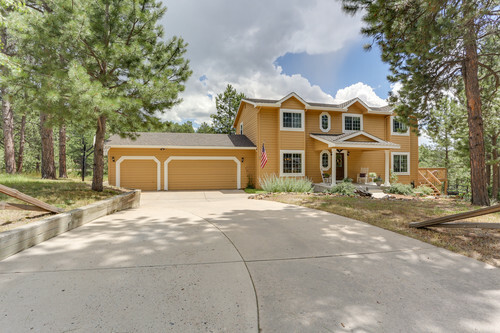 Absolutely gorgeous 2 story in pristine condition on a cul de sac with Pikes Peak views, in an amazing setting on a treed lot. Feels like so much more as the lot connects to 22 acres of common land & a nearby pond. This beautiful home offers generous light that accentuates the glistening teak floors throughout the main level, slab granite kitchen countertops, stainless appliances to include a gourmet induction cooktop & convection oven. Elegant xeriscaped landscaping & private deck surrounded by tall pines.